New Age Metals (NAM) Outlines 2017 Exploration Plans For River Valley PGM Projects, Sudbury – New Age Metals Inc.
February 15, 2017 Vancouver, Canada – New Age Metals (“NAM”, the “Company”) (TSX.V: NAM; Frankfurt: P7J.F; OTCQX: PAWEF is pleased to announce exploration plans proposed for 2017 at its 100% owned River Valley platinum group metal (PGM) projects near Sudbury, Ontario. The exploration focus will be on drilling priority PGM targets generated from modelling of previous exploration data and of new data from geophysical surveys to be conducted over the Pine Zone-Dana North Zone-Pardo Zone area of the vast River Valley PGM deposit (Figure 1). 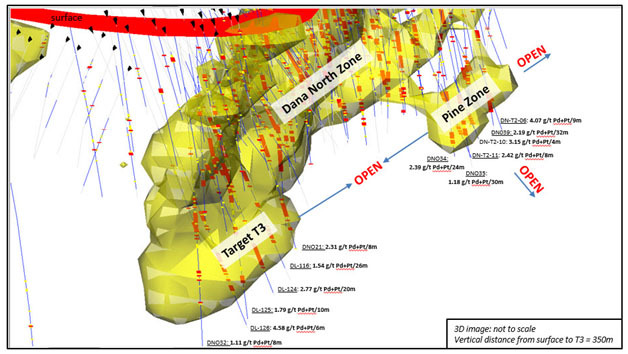 Three-dimensional geological and structural modelling of the available drilling data, particularly from the 2015 and 2016 programs that discovered the Pine Zone (see press releases dated March 11, 2015 and December 13, 2016), highlights the potential to expand the PGM mineralization in three directions (Figure 2): 1) down-dip towards Target T3, 2) east along strike towards Pardo Zone 2 km away, and 3) up-dip 100 metres to surface. 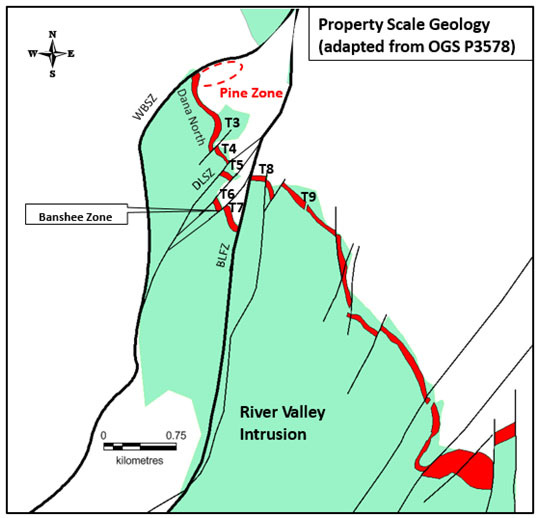 The Pine Zone as currently defined is located under the main access road into the north part of the River Valley PGM deposit, in the immediate footwall to measured and indicated PGM resources at the Dana North Zone (see NI43-101 Technical Report dated May 1, 2012), and is overlain by mineral leases owned 100% by NAM. As for geophysics, a study is currently underway (with Blaine Webster, PGeo consulting geophysicist) to recover and review the historic surface and borehole induced polarization (IP) survey results for the Dana North and Pardo Zones. The PGM mineralization occurs closely associated with disseminated chalcopyrite-pyrrhotite mineralization with a strong positive IP chargeability response. The review study results will aid planning of the 2017 surface and borehole IP geophysical surveys of the Pine Zone-Pardo Zone-Target T3 area. Modern 3D IP survey systems can detect disseminated sulphide zones at greater depths and with better resolution than previous systems. Software packages can now more accurately model the position of IP chargeability anomalies in 3D space to aid development of drill targets. A total of up to about 50 line-km is proposed to be IP surveyed in the spring/summer 2017, prior to drilling. The 2017 drill program will focus on expansion of the Pine Zone up- and down-dip and laterally, based on the results of the geological and geophysical modelling activities as outlined above. A total of up to about 5000 metres is proposed to be drilled in about 20 holes, beginning in the summer/fall 2017. The exploration plans proposed for 2017 are subject to financing in the capital markets and (or) finding a Strategic Partner and approval of Exploration Permit Applications. Figure 1. Location of the Pine-Dana North-Pardo Zones at the north end of the River Valley PGM deposit. The apparent gap between the Dana North and Pardo Zones is attributed to offset along the Grenville Front fault system. The Pine Zone is interpreted from the 3D modelling to have been part of Dana North that has been transposed into parallelism with the Grenville Fault during movement and deformation along the latter structure. Figure 2. River Valley Project Pine Zone-Target T3 drill intersects. View looking west from above the horizontal. NAM’s flagship project is its 100% owned River Valley PGM Project (NAM Website – River Valley Project) in the Sudbury Mining District of northwest Ontario (60 kilometres due east of Sudbury, Ontario). Presently the River Valley Project has Measured + Indicated resources of 91 million tonnes @ 0.58 g/t* palladium, 0.22 g/t platinum, 0.04 g/t gold at a cut-off grade of 0.8 g/t for a PdEq of 2,463,000 ounces PGM plus gold. River Valley PGM-copper-nickel sulphide mineralized zones remain open to expansion and are undergoing continued exploration. The contents contained herein that relate to Exploration Results or Mineral Resources is based on information compiled, reviewed or prepared by Dr. Bill Stone, Principal Consulting Geoscientist for Pacific Northwest Capital. Dr. Stone is the Qualified Person as defined by National Instrument 43-101 and has reviewed and approved the technical content of this news release.